I graduated from Oregon State University with B.S. 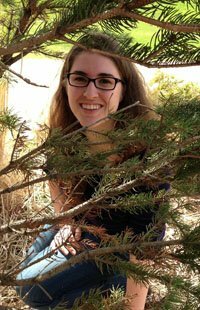 degrees in wildlife science and psychology, interested in animal cognition and using wildlife behaviors to help solve conservation problems. I’ve worked on projects with wild rodents, mule deer, elk, tree swallows, violet-green swallows, captive gray wolves, drafting a Conservation Efforts Assessment Plan, and investigating canine understanding of probability. I have also worked for the US Forest Service as a summer wildlife technician for two seasons, USGS and BLM as a feral horse and burro research technician, and contracted with the Oregon Department of Forestry as a marbled murrelet surveyor. I was accepted into the StFX Biology MSc program, and will be investigating lobster bait preferences and behavior around food sources. After I complete my master’s degree, I hope to move on to a Ph.D. in wildlife behavior and conservation. My name is Emmerson Wilson, I am a third year biology student at Saint Francis Xavier University and am working towards completing an honours in biology with a minor in economics. I have been working at Wyeth lab doing research on potential environmentally friendly antifouling treatments. My biggest passion is the outdoors, and so I spend my summers leading white water canoe trips throughout Canada. I am a fourth year student working towards my BSc in Aquatic Resources and Biology. I have always been interested in animal behaviour and conservation so taking these programs at StFx seemed like a perfect choice for me. This summer I am working as a research assistant, mainly dealing with behavioural toxicology in the American Lobster. I am very excited to be working with Dr. Wyeth and Ella Maltby on this project and am excited to see what we can discover. After my undergrad, I hope to continue on with my studies in marine sciences. I am a second year student with a major in biology. Born in Egypt, I have lived in Montreal for 7 years before moving to Antigonish. I am very excited to start doing research this summer, as I will be able to learn new things and gain a lot of experience. I will be working with Alex, studying gene expression in the nervous system of Lymnaea. Doing this research will also help me prepare to do a master’s degree after graduating, in hope of applying to medical school in the future. My other hobbies include playing soccer, video games and watching anime. I’m a second year student in the Bachelor of Business Administration Program, and I’m from We’koqma’q First Nation. I had not aimed towards going into science until I heard of this research project that was involving my own community. I’m honoured to take this position doing research for the summer involving anti-fouling. It’s amazing to be able to experience a different environment and also to be a part of this project because it’s beneficial to my community. I’m very glad that I got the opportunity to open a whole new world to me in the biology and chemistry departments. I’m really looking forward to spending the summer doing research, and will be testing anti-fouling materials in We’koqma’q with Michelle Hodgson. Entering St. FX as a mature student, I was able to take some time off between high school and university. During that time, I travelled to various places, but the most memorable experience involved 3 short weeks of volunteering at an elephant sanctuary. It was during that trip that I discovered how passionate and interested I am in wildlife, and specifically, wildlife conservation. Now going into my third year as an Honours student in Biology, I’m extremely excited that I am involved in my second year of research. After completing my first year, I was lucky to receive a research position studying one of Canada’s rarest plants, Geum peckii, located in Brier Island, NS. As a new member of the Wyeth lab, I will be collaborating with two other students to find environmentally friendly antifouling coatings in hopes that we can apply our methods to aquaculture netting. After I finish my undergrad, I hope to do a Masters degree relating to either wildlife conservation or animal behaviour. I am a fourth year student pursuing my BSc in Honours Chemistry. I am originally from Ottawa, and for the past two summers I have worked at the Children’s Hospital of Eastern Ontario (CHEO) Research Institute researching rare genetic disease including developing a zebrafish animal model for Pyridoxine-Dependent Epilepsy. This year I am working on developing environmentally-friendly antifouling surfaces for marine aquaculture, specifically against mussel fouling in the Bras D’Or lakes in Cape Breton as part of my thesis work. After my undergraduate degree, I am interested in pursuing a career in medicine, and I hope to someday have the opportunity to join Medecins Sans Frontieres (Doctors Without Borders). I would like to always be involved in research in some capacity throughout my career. My other interests and hobbies include drawing and painting, singing and playing guitar, running, playing soccer, skiing, being a coxswain on the StFX Rowing Team and a member of the StFX Tennis Team, hiking and traveling. Theora is study sea slug movement patterns and a potentially new way animals might use magnetic fields to navigate. Theora says: Raised in Antigonish, I’m a second year student in the biology program here at X. Though I have yet to find my focus I am excited about exploring the wide world of biological studies. Some of my other passions include religious studies, sketching, bookmaking and watching bad horror movies. My interests encompass much of the diversity of animals, but my research has focused primarily on aquatic invertebrates, particularly their behaviours and nervous systems. I’m especially intrigued by how nervous systems control adaptive behaviours – responses appropriate to the cues animals encounter in their natural habitat. That makes me a neuroethologist, but my students and I follow new questions into many other areas of invertebrate zoology. I’m also keenly interested in helping students think like biologists, applying sound analytical skills to understanding organisms, and this pervades both my teaching and approach to mentoring student in research. My professional info (CV, etc.) is here and contact details are here. I graduated in 2010 from the Faculty of Applied Science at Umm Al Qura University, Saudi Arabia, where I earned a bachelor`s degree in biology. Throughout my studies, I consistently earned honours. I received a scholarship from the Ministry of Higher Education in Saudi Arabia, which fully sponsored me to pursue my studies in the field of biology. Getting such a scholarship is difficult, as they are highly competitive. All these accomplishments have encouraged me and motivated me to continue my studies at St. Francis Xavier University. Now, I am studying animal behavior and how Lymnaea Stagnalis finds food. After my masters degree, I hope to have a job in Saudi Arabia or continue on to a PhD. A fun discussion: RCW and Dr. Christopher Byrne shared a special seminar on the scientific method: patterns, mechanisms, hypotheses, deduction, induction and more. Congratulations to Alex Young – today was MSc thesis submission day!